The onset of the recent financial crisis in late 2007 created an intellectual crisis for conservatives, who had been touting for decades the benefits of a hands-off approach to financial market regulation. As the crisis quickly spiraled out of control, it quickly became apparent that the massive credit bubble of the mid-2000s, followed by the inevitable bust that culminated with the financial markets freeze in the fall of 2008, occurred predominantly among those parts of the financial system that were least regulated, or where regulations existed but were largely unenforced. Predictably, many conservatives sought to blame the bogeymen they always blamed. 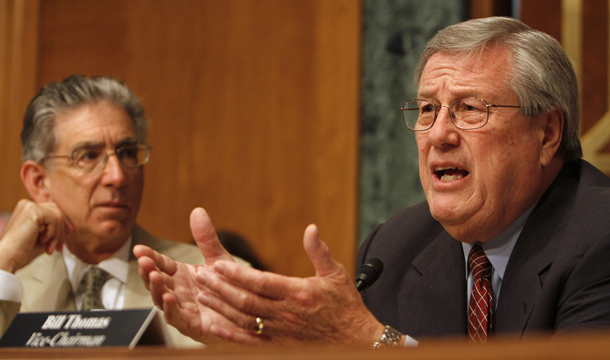 In March of 2008, Sen. Jon Kyl (R-AZ) blamed loans “to the minorities, to the poor, to the young” as causing foreclosures. Not long after, conservative commentator Michele Malkin went so far as to claim that illegal immigration caused the crisis. This tendency to shift blame to minorities and poor people for the financial crisis soon developed into a well-honed narrative on the right. Swiftly and repeatedly many conservatives blamed affordable housing policies—particularly the affordable housing goals in place for the two government sponsored mortgage finance giants Fannie Mae and Freddie Mac and the 1977 Community Reinvestment Act that applies to regulated lenders such as banks and thrifts—for the massive financial crisis that occurred. This despite the fact that as recently as 2006 prominent conservatives, including FCIC Republican member and American Enterprise Institute Senior Fellow Peter Wallison, were arguing that Fannie and Freddie needed to do more lending to low-income communities and minorities. Last week, the Republican minority on the congressionally created Financial Crisis Inquiry Commission continued this tradition of willful blindness, issuing their own self-described nine-page "primer" on the financial crisis—one that attempts to lay the blame once again on Fannie Mae, Freddie Mac, and the Community Reinvestment Act. The picture they paint is reflective of a mindset they displayed last week when all four Republican members tried to ban the phrases "Wall Street," "shadow banking," "interconnection," and "deregulation" from the final report. These terms are important to understanding what happened in the 2000s. But equally damning is this—the minority members of the FCIC got their facts wrong, their time frames jumbled, and their selection of relevant facts skewed to reflect their libertarian biases. The ideological imperative to blame the government, and more importantly to avoid the culpability of laissez faire economics, have overridden all other considerations, including those of actually looking at the facts. As the FCIC staff reports released so far in the run up to the final report have demonstrated, the primary fuel of the financial crisis was a hands-off approach to regulation. This ideologically driven lack of regulatory oversight allowed tremendous growth of the "shadow banking system," a largely unregulated web of complex financial transactions that essentially served the same functions as the existing banking system—attracting short-term funds from those seeking safe, liquid investments and using these to finance long-term loans, particularly residential mortgages—but without government oversight to ensure that these activities were being done safely and soundly. The market activities of the relevant parties clearly show the problem with the argument made by the minority FCIC members. The market shares of Fannie Mae, Freddie Mac, and CRA-regulated lending institutions dropped tremendously during the housing bubble. Meanwhile, the market share of private mortgage securitization, which the FCIC majority largely blames for the crisis, and which the FCIC minority completely ignores, grew in lockstep with the rise of the housing bubble. The relative market share of Fannie Mae and Freddie Mac dropped fairly dramatically during the 2000s bubble, from a high of 57 percent of all new mortgage originations in 2003, down to 37 percent at the height of the bubble in 2005 and 2006. Notably, this decline occurred contemporaneously with the unsupported rise in housing prices and the deterioration in underwriting standards that virtually all observers blame for the collapse of the housing markets. Similarly, the market share of financial institutions for which CRA applied has been steadily declining since 1977, when CRA was passed. CRA-regulated institutions, primarily banks and thrifts, accounted for only 28 percent of all mortgages originated in 2006 (the height of the bubble), a significant decline from their share in the late 1990s and early 2000s. As with Fannie and Freddie, this market share drop occurred in lockstep with the rise of the housing bubble. 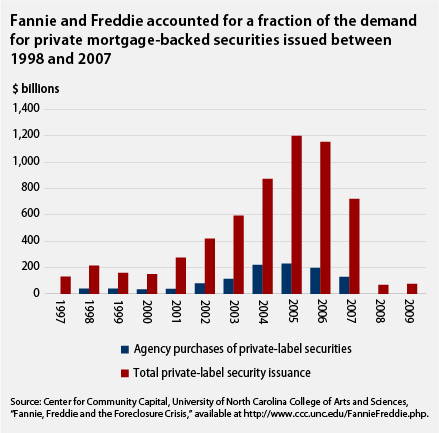 In contrast, the market share of private mortgage securitization, a pillar of the “shadow banking system” that was not backed by the federal government and not regulated for safety and soundness in the way that Fannie, Freddie, and regulated banks and thrifts were, rose sharply and contemporaneously with the rise of the housing bubble. In 2002, the share of mortgages originated by private securitization was just over 10 percent of the total market. Over the next four years, this share grew rapidly, accounting for nearly 40 percent of all mortgage originations by 2006. 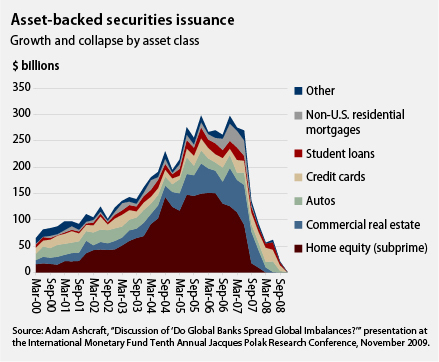 As a percentage of all mortgage-backed securities, private securitization grew from 23 percent in 2003 to 56 percent in 2006. Equally conclusive are the default rates of mortgages originated for these various lending channels. If the conservative view was correct, one would expect to see mortgages originated for Fannie and Freddie securitization, as well as those originated for purposes of CRA, to default at higher rates, since these were the loans directly subject to affordable housing policies. In fact, we see quite the opposite, as these loans have performed exponentially better than those originated for private securitization, which the FCIC Republicans ignore. Mortgages originated for private securitization defaulted at much higher rates than those originated for Fannie and Freddie securitization, even when controlling for all other factors (such as the fact that Fannie and Freddie securitized virtually no subprime loans). Overall, private securitization mortgages defaulted at more than six times the rate of those originated for Fannie and Freddie securitization. Similarly, mortgages originated for CRA purposes have performed at much higher rates than loans originated for private securitization, going into foreclosure 60 percent less often than loans originated by independent mortgage companies that were key to providing the mortgages needed to supply private securitization. But even if these facts didn’t exist, the FCIC Republican narrative fails miserably in explaining the financial crisis. To illustrate why it fails, let’s perform a simple thought experiment our colleague Matthew Yglesias has suggested: Let us suppose that the GOP’s argument is correct, and that government affordable housing policies were 100 percent responsible for the housing bubble and the flood of unsustainable mortgages that were originated during the 2000s. How could the FCIC Republican argument possibly explain the analogous housing and financial bubbles that occurred contemporaneously in other countries such as Iceland, Ireland, the United Kingdom, and Denmark, which did not have Fannie or Freddie Mac or CRA? The FCIC majority argument has a plausible and compelling explanation for the global credit bubble—that an unregulated and overleveraged shadow banking system systematically underpriced credit risk. The FCIC Republican minority has no explanation for these contemporaneous bubble-bust cycles that occurred in other countries. Moreover, the FCIC minority narrative fails to explain the huge private-sector demand for subprime and Alt-A mortgages, or the mortgage-backed securities created out of these mortgages. The crux of the FCIC Republican argument is the affordable housing goals and CRA created the demand for risky subprime and Alt-A mortgages, which in turn created the huge demand for the private mortgage-backed securities that led to the 2000s housing bubble. 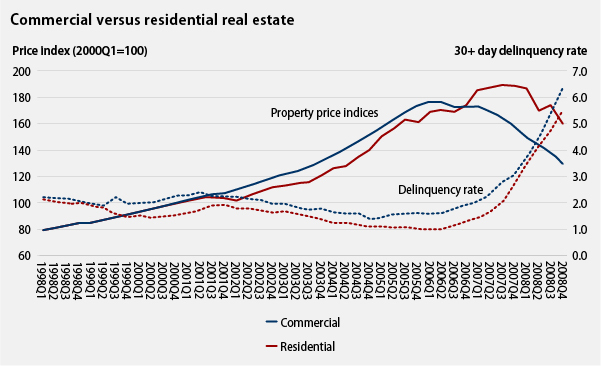 Instead, the common thread was under-regulation at every level of the financial system leading to a general real estate bubble. The bursting of the bubble first in the subprime home mortgage market was a symptom of just how little consumer protection was left, as federal regulators told state authorities who tried to stop more abusive mortgage companies to stand down due to federal preemption doctrines. David Abromowitz is a Senior Fellow at the Center for American Progress. David Min is Associate Director for Financial Markets Policy at the Center.